How Does an Automatic Home Backup Generator Work? The generator automatically detects a power outage and delivers backup power to your home within seconds. You’ll have peace of mind knowing that you’re covered – the generator will keep your power running for as long as the power is out – whether that’s for two hours or two weeks. Maybe it’s a storm or an equipment failure. In any case, the electricity you’re dependent on is suddenly gone. Within seconds, your generator prepares to restore your home’s power. Your generator is up to speed and generating electricity. The automatic transfer switch sends generator power to your home and will continue providing power until your main power source returns. Your generator systems detects when utility power is returned and restores utility power to your home. The system then returns the generator to standby mode. This short animation shows how a Honeywell home backup generator restores power to your home during a power outage - automatically. A Honeywell generator provides peace of mind during a power outage and automatically protects what matters most to you and your family. 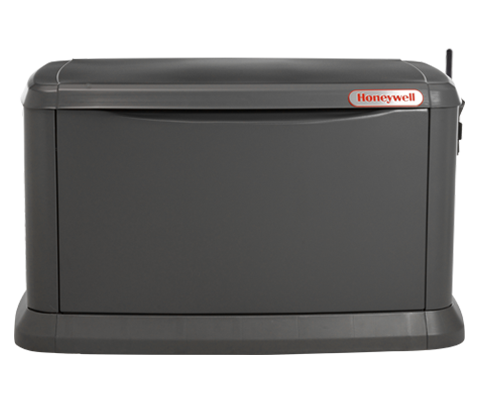 Browse the full line of Honeywell Home Generators to find the right fit for your needs.